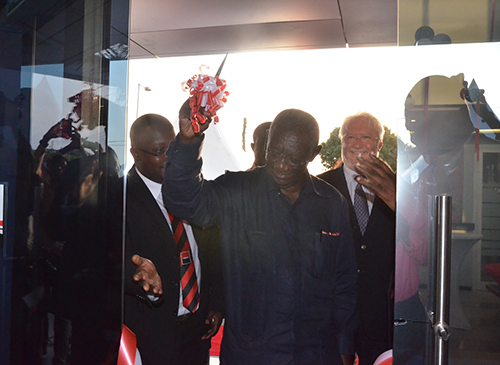 Ex-President J.A Kufuor cutting the tape as management of the bank looks on. Societe Generale Ghana has officially inaugurated an ultramodern branch at East Legon in Accra. According to Gilbert Hie, Managing Director of the bank, the new branch of the bank is strategically positioned to serve as a hub for its retail and SME activities to meet the needs of customers. Speaking at the event recently, Mr Hie said the East Legon branch was the 40th branch to be opened in addition to the Kasoa, Osu, Takoradi and Ashiaman branches, which were opened this year. “The bank is committed to providing quality products and services that best satisfy customers’needs by employing the highest standards in professionalism, team spirit and innovation. The East Legon branch has modern banking premises which will serve customers in East Legon and its environs,” he stated. Kofi Ampim, Board Chairman of Societe Generale Ghana, disclosed that the bank’s long-term strategy is to build customized branches to cater for the specific needs of customers in each community. “At Societe Generale, our watchword is ‘customer satisfaction is our business’. Superb service to our clients is the only way through which Societe Generale Brand can be upheld as the preferred banking institution of choice in Ghana,” Mr Ampim said. The colourful ceremony was attended by dignitaries such as former President John Agyekum Kufour, the Board of Directors, management and staff, among others.